Tiara Equine offers top notch school horses, suitable for a variety of levels. Contact us for more information on current availability and not yet listed horses. Our coaches are excellent match makers. If you are looking to accomplish specific goals through a purchase, or on site lease, we can locate the right horse for you. Please check out our horses biographies below. Please note, all of our horses that are not fully leased are also available for lessons. We do not use additional school horses; they are all well trained, top quality horses to facilitate learning. Experience: Very solid pre-training horse, dressage to 2nd level. Handy jumper. Highlights: Novice Adult Champion 2013, Novice Adult Year End Winner 2013, 2nd Place Kentucky Midsouth Individual 2013, Novice Adult Year End Winner 2014, Novice Adult Champion 2014, Overall 2nd Place Pre-Training Senior 2014, Kentucky Team Challenge 1st place 2014. Very competitive almost always finishing in the top ribbons on his dressage score. Available For: Bronze or Silver lease for hunter, jumper or eventer. An excellent confidence builder. Highlights: A very successful mare at all levels. She has never had a stop cross country in her long career. OHTA Pre-Entry Championships 2nd place 2014, Pre-entry Year End 2nd place 2014, OHTA Pre-training Championships 6th Place 2014, Entry 2nd Place Year end 2011. 2015 Open Pre-Entry 2nd place at finals and 1st place Overall Year end. Breed: Imported Dutch Warmblood gelding. Available For: Bronze or Silver lease to Jumper, Eventer or Dressage rider. Experience: Show Jumped to 1.35 in Europe and the states. Dressage to 4th level, Evented unaffiliated to prelim, and recognized to training level. Highlights: Countless career ribbons and wins, in all levels and disciplines. Top 10 all season for 2014 leaderboard, top 10 finish at OHTA Championships novice adult 2014, and 3rd place Kentucky Midsouth Team Challenge 2014. Experience: Pretraining eventing and training level dressage. Highlights: Rozen started her show career in 2015 and has wowed judges with her huge movement, scoring 70% at her first dressage show, and placing in nearly every outing in the open entry. She upgraded to pretraining with success and finished 2nd in the Novice at Kentucky Midsouth. Available For: Bronze lease, any discipline. An excellent confidence builder. Highlights: Sunny did his first show season in 2014. He won events in PE and OE including 2014 OHTA Championships Open Entry, 1st place Overall Highpoint Open Entry. He was also second in Kentucky at Midsouth, and 3rd in the team challenge. Sunny finished 2nd in the Senior Entry Championships in 2015. Highlights: Comet is a lovely, fancy moving, draft cross who is a tidy jumper. Since joining the Tiara team, Comet has moved up to pre-training and been competitive with several different riders. He brought home many ribbons in both 2015 and 2016 at Entry and Pre-Training. Available For: Bronze lease to Pre-training or Training Rider. Highlights: Won his first event at Entry, went on to an additional win at Pre-Training, and High Point Horse of the day at a Dressage show. Finished 2014 OHTA Year End Open Pretraining Champion. He also ventured to Kentucky and won both the Individual and Team Challenge. He finished his first show season as a demo horse at the Royal Winter Fair. Breed: Clyde, Paint, Arab cross gelding. Available For: Bronze or Silver Lease for any discipline. Experience: Evented at Pre-Entry and Entry, done some dressage and jumpers. Highlights: Iago finished in the ribbons at almost all of his events during his first show season, including coming 4th in the Open Entry Championships, and winning the Open Pre-Entry Championships. He finished the season in third place for the open entry division for Ontario. Available For: Bronze or Silver Lease for any discipline. An excellent confidence builder. Highlights: Chevy just started her event career in 2014, and was unfazed. She is a very honest jumper, and a very safe horse for a new eventer. She took her new eventer to a ribbon at Glen Arden this fall. Available For: An eventer or dressage rider going up to pre-training. Experience: Young horse from a former driving career. This boy was a rescue from a feed lot in April 2014. He has since done a season of showing and absolutely loved it. 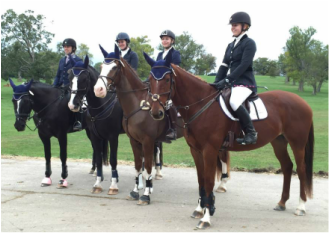 Highlights: Amstel competed all season at entry with several different riders, bringing home ribbons in both the open and senior division. Available For: Bronze lease silver or gold lease to rider looking to do dressage or hunters. Bella is suitable for riders needing a confidence builder and those who love hacking! Experience: Very well schooled in dressage; confirmed to 2nd level, some 3rd level training. Highlights: Bella has a long record in the dressage ring, and has now won in the hunters as well with her text book form, and adjustable canter. Bella did her first season of eventing in 2016 and won every outing she attended. Available For: Bronze lease to an eventer looking to go PE-PT or a jumper. Highlights: Dream and her 2016 leaser were 3rd at Champs, won and event, and finished 2nd Overall in 2016 as well as 2nd in the Novice Adult. Highlights: Soon to come in both the dressage ring and eventing! Stay tuned for the rest of our excellent show horses.